Vancouver residents have begun to declare themselves "Team Otter" or "Team Koi" as an elusive otter feasting on expensive fish in a tranquil garden pond continues to evade capture. The otter mysteriously made its way to the Dr. Sun Yat-Sen Classical Chinese Garden last week and has gobbled up seven decorative koi, many of which have been there for decades. A wildlife relocation expert started work Friday and set three new traps containing rainbow trout and an oil mixture, but staff are still waiting for the critter to jump into them, the city's parks director said Saturday. It's hard to say whether the otter has found the traps or shown any interest in them, Howard Normann said. "Not enough to get into them, that's for sure." Garden staff were discussing options Saturday to remove the koi from the pond to keep them safe, but Normann said it's not as easy as it sounds. "They're sensitive fish. It's pretty tricky to do," he said. He declined to share the wildlife relocation's expert's name or where he's from but Normann said staff are confident in his abilities. "He's an experienced otter trapper, so that's about as confident as we can get," he said. 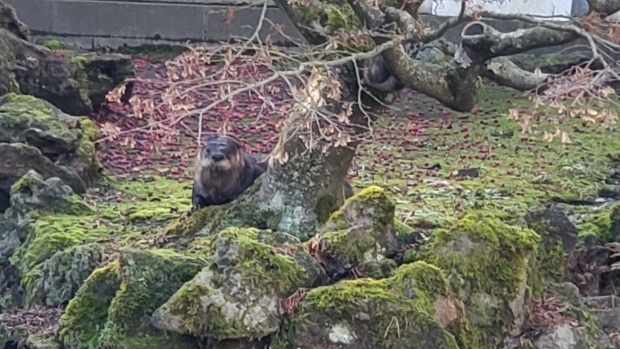 It's still unclear how the otter found the garden, which is surrounded by busy streets, but a resident recently contacted Normann to report the critter may have been living in a nearby park between the Sun Yat-Sen garden and False Creek. The garden has remained closed since the otter set up shop and once it's captured the plan is to relocate it to the Fraser Valley. In the meantime, the story has captivated people in Vancouver and beyond, with social media users joining .TeamOtter or .TeamKoi. "This is bad for the otter, so removing him is in everyone's best interest," one .TeamKoi member said. Initially, the group planned to donate all proceeds to the classical garden, but founder Louis Lapprend said the garden has asked that the money be given to a wildlife refuge instead. Lapprend said people appear to be fascinated by the story in part because it's a battle of wits similar to a Wile E. Coyote and Road Runner cartoon, in which the coyote can never quite catch his prey despite trying increasingly ridiculous schemes. "I think there's a comedy aspect to it, because every day the park board staff will set up new traps and every morning, they have to publicly announce the otter visited the traps, ate all the bait, and didn't trigger anything," he said. "On a more philosophical level, I think it's about the way that we live in a big city, we try to control the environment, and suddenly something completely unpredictable happens and it's nature intruding. I think it does something to our brains. It triggers a reaction which is fascinating." He's selling the buttons out of the group's office and expects to have online sales ready on Sunday. The first small batch is already close to selling out and he's placed a larger order that should come in soon, he said. Lapprend isn't sure whether "Team Koi" or "Team Otter" is prevailing because the buttons designed by artist Pearl Low are so cute that people are willing to betray their loyalty to buy one bearing the opposing team's mascot, he said. He adds that his allegiance is definitely with the clever otter -- although he can see both sides. 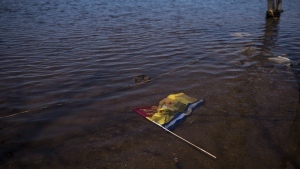 "I completely understand why many people are upset that the koi are getting eaten. They've been part of the landscape for several decades and are defenceless compared to the predator," he said. "I'm rooting for the otter and I hope nothing too bad happens to it, but it does need to be captured at some point."